Every year, around 900 teams descend upon Ludington to compete at Stearns Park, with thousands more coming as spectators. The popularity of the Ludington Gus Macker is partly due to its location--basketball hoops are set up along Lakeshore Drive and Stearns Outer Drive, with Lake Michigan just steps away. The view, the cool breezes, and the expansive beach provide the perfect setting for the heated competition. It is usually the largest Macker tournament in the United States. Registration is now open through May 24th at 5pm. Cost is $160 for a four-person team. To register or find more information, visit macker.com. Potential event volunteers should contact Kathy Fisher at (231) 845-7018. 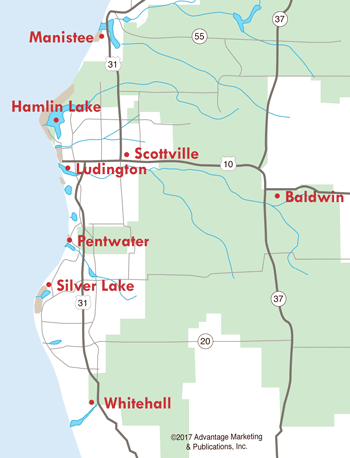 The tournament was born back in 1974 in Lowell, Michigan. Scott McNeal (alias Gus Macker) got together with 18 friends and $18 to play a friendly 3-on-3 basketball game in his parent's driveway. The tournament continued to grow, and due to the tremendous interest from outside communities, it took to the road and moved its home base from Lowell to Belding in 1987. Today, Macker is played in outdoor and indoor courts in over 75 cities throughout the country, drawing over 200,000 players and 1.7 million spectators. But even with this growth, it continues to feel like a "hometown" game. The Gus Macker tournament is always a wholesome activity for all ages and talent levels. 2018 marked the 27th anniversary of Gus Macker in Ludington. Because of its longevity and beautiful location, the Ludington Gus Macker Committee and the Ludington & Scottville Chamber of Commerce will be inducted into the Gus Macker Hall of Fame in 2018. In the 27 years of Macker in Ludington, over $300,000 has been returned to the area's schools to purchase uniforms and equipment. These teams donate their time in setting up hoops, fences, and cleaning up. In order to make the tournament run smoothly, nearly 400 other volunteers are needed, from checking-in participants to being a Gus Buster. 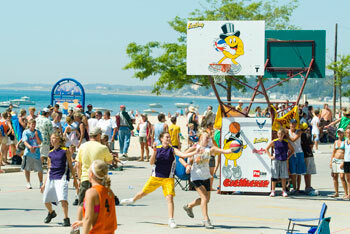 Check out Ludington Lodging for places to stay during Gus Macker and Ludington Restaurants for great places to eat.